Last two weeks the weather was, how shall I put this, not smoke friendly. So I pulled out my dutch oven, or, to be precise, a bigger brother of a wok, made of cast iron, which can be used on a gas stove top, and… well, there was a cubed beef, potatoes, carrots, onions…. so here we go – braised beef with potatoes, the way my granny used to make it 30 years ago. 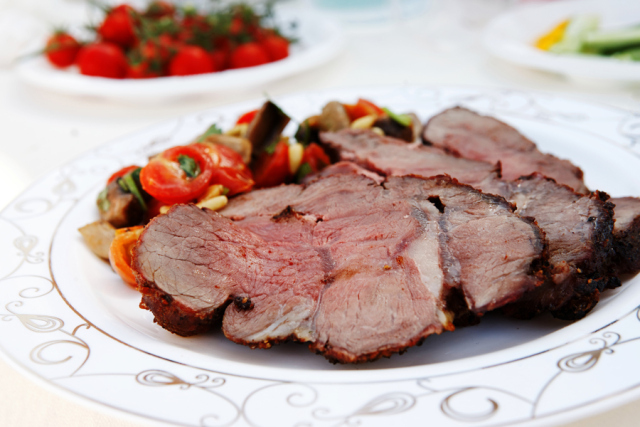 Roast beef is one of my favorite dishes… But when grilled, it becomes an absolute treat, and I am going to show you one of the simplest and easiest ways to make it. Also, you’ll find a very interesting spice mix, as well as a salad, which has become my all times companion to grilled meat.